Now teens don’t have to worry about embarrassing metal braces in their yearbook photos or Facebook profiles – introducing Invisalign® Teen! 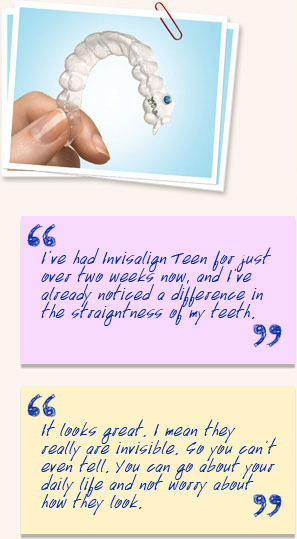 Invisalign® Teen is the clear way to straighten teeth without metal braces. Instead, this treatment uses removable aligners that are virtually invisible, which means you can straighten your teeth without anyone knowing. You can still eat and drink what you want. Also, you can brush and floss normally to maintain healthy gums and teeth, and there are no wires, metal, or brackets to cause mouth abrasions. We went to leading orthodontists, parents, and teens themselves to custom-design an Invisalign® system just right for the dental needs of teenagers. With blue-to-clear color-changing aligners to show how long each aligner has been worn, six free replacement aligners in case some are lost or broken, and other changes designed to accommodate growing mouths, Invisalign® Teen is the perfect teeth-straightening system for today’s teens’ busy lifestyles! By using advanced technology, Invisalign® Teen can treat a broad range of dental and orthodontic conditions, which, in the past, were usually treated with traditional braces.